We invite you to explore India - the Land with infinite beauty ! Whether you soar high into Himalayas or peer under the ruins of the Ancient monuments dotting the landscape of India, you will cherish the experience long after your visit ! This India Travel Guide on Basilica of Our Lady of Snows Pallippuram is free from any commercial interest! This site is dedicated to promote India - the vast subcontinent, its glorious past, magnificent landscape and its infinite variety. It is about 34 km from the Basilica of Our Lady of Ransom, Vallarpadam. 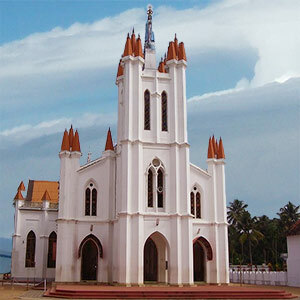 The Church is just 3 km from one of the most beautiful beaches in the West Coast of India - Cherai Beach. This basilica is next to (about 500 meters) the oldest European Fort in India - Pallipuram Fort. Cochin /Ernakulam region has probably the highest numbers of Basilicas in India - 5 - St. Mary's Cathedral Basilica, Santa Cruz Basilica, Vallarpadam Basilica of Our Lady of Ransom, Basilica of St. George and Basilica of Our Lady of Snows. Kerala also has the maximum number of Basilicas in India - 8 in all out of the total of 21. The Church of Our Lady of Snow - Nossa Senhora das Neves originally built by the Portuguese in the year 1507 AD was elevated to a Basilica in 27th August 2012 by Pope Benedict XVI. Papal Nuncio to India, HE Archbishop Salvatore Pennacchio declared this Papal decree at the grand celebration of the silver jubilee of Kottapuram Diocese in the Ecclesiastical province of Verapoly, Kerala. What was started as a small chapel by the Portuguese after they built the Pallipuram Fort in the year 1503 AD, to venerate our Lady was rebuilt with Gothic arches in the year 1931. It saw major renovation in 2006 before it celebrated its 500 year of existence, the next year - 2007. Brief History: The name - Our Lady of Snows (Manju Matha in Malayalam literally means Mother of Snows or Mist) to this church is because of what happened on one day in 1789 AD during Tippu Sultan's intended invasion of Travancore state through the river Chalakudy. Tippu Sultan was exceptionally harsh on Hindus and Christians. He forcibly converted Hindus and people of other faith to Islam and razed many temples and churches. So on that day when his Army was searching for the Christians near Vypin, they took shelter in this Pallipuram church and prayed for the intervention of our Lady. Miraculously a thick mist descended on parts of the island forcing the invading Moslem Army to think that the region was part of the Arabian sea. In addition, Tippu lost a lot of his men in the flash flood in the river Periyar forcing him to retreat. From that day the grateful people of this region called Our Lady as 'ManjuMatha'. Festival of our Lady of Snow: Yearly feast of this Basilica is celebrated on 5th August every year. This annual feast is symbolic of the dedication of the Church of Santa Maria Maggiore on the Esquiline Hill in Rome - the original Church of Our Lady of Snow. The 15 day feast starting from 30th July ends on the Day of Assumption of Our Lady - 15th August.